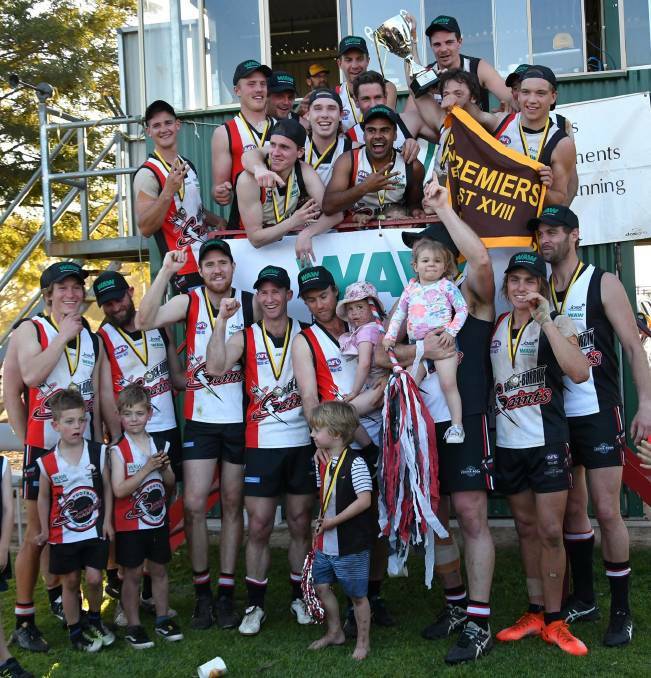 Brock-Burrum Saints are the 2018 Hume Football League premiers after they outclassed Jindera by 50 points at Walbundrie on Saturday. The Saints’ premiership was its third since its inaugural 2013 triumph post-merger and was its tenth straight win to complete its season. Brock Burrum after kicking the first three goals of the game finished with nine of the last 10 goals to inflict further grand final pain on Jindera. The combine finished with a bang adding 8-6 for the final quarter to Jindera’s 1-3 in front of a huge crowd that paid over $47K at the gate – the second largest on record. The Bulldogs, who showed great tenacity to win its first three finals matches, has now lost the last three grand finals. 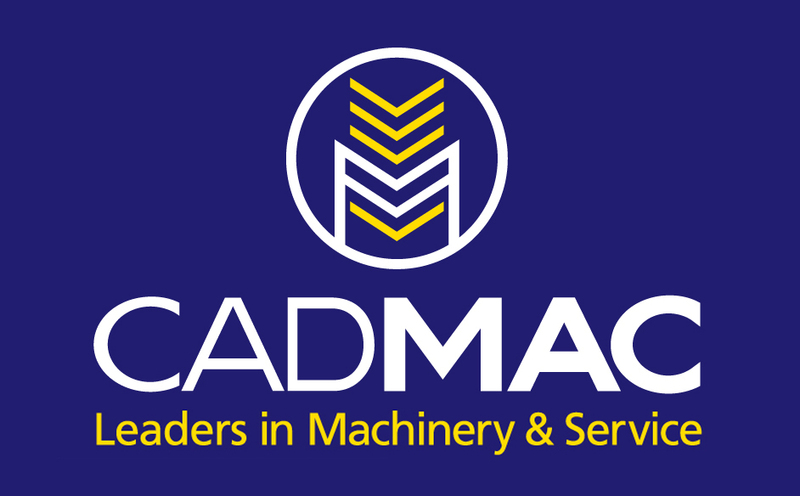 The margin blew out in the last quarter after a Michael Galvin goal for Jindera got them within six points at the six-minute mark of the final quarter. But the Doggies’ tough finals campaign finally hit them as the Saints finished full of run and carry to take home a well-deserved victory. The recruitment of former Ovens and Murray Football League star Matt Seiter certainly paid dividends, with the big man taking out best afield honours. Seiter, who had 31 possessions and over 40 knockouts in the ruck contests, was awarded the Des Kennedy Memorial medal in a superb display. The former Morris Medalist gave his talented midfielders led by Kade Stevens, Nico Sedgwick and Darcy IAnson an armchair ride in the clearances. Despite the big margin in the finish, the first three and a half quarters reflected a very tight and tense contest with Jindera leading for a big part. 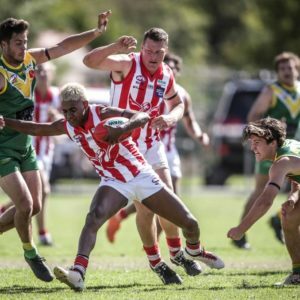 The Saints led at quarter time by just two points as Jindera worked its way back into the contest with the last three goals in the opener and then three of the four in the second. The brave Doggies took a half-time lead of eight points with Dylan Pettingill superb with three first-half goals including a brilliant checkside from 30 out. The Saints fought back after half-time with three of the four goals for the quarter. Jindera hit the post twice late in the term as the Saints led by five points going into the last. Aiden Johnstone extended the lead to two goals after three minutes before Galvin got one back for Jindera. A brilliant burst, that netted four goals in six minutes, put the game to bed with Nick Brockley kicking three goals and McCudden his fourth for the game. At the other end of the ground, Jeremy Luff did a brilliant job containing Jindera goalkicking ace Trent Castles to just one goal. Luff two weeks previous also kept Henty goalkicking machine Damian Cupido quiet and has had a huge impact on the Saints’ success. Dylan Pettingill and Sam Myors completed terrific finals campaigns with valiant four-quarter efforts, while Matt Osborne and Tom Weldon played strongly. Brock-Burrum had contributors all over the ground with Lachie Boyd, John Roy Williams and Eddie Ziebarth among the best. 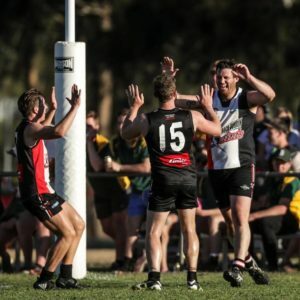 Rand-Walbundrie-Walla completed its first premiership in senior football, defeating the previously unbeaten Jindera by 49 points in the seconds decider. A best on ground performance from Giants’ forward Nathan Brown was the highlight, with Brown booting six goals. Nick Turner was not far behind with four goals as the Giants completed four straight finals victories to run out deserving winners. Jindera led at half-time by three points before the Giants, with Ryan Lavery and Luke Bennie dominating, kicked nine goals to two in the second half. Osborne took out the under 17 decider outclassing the previously unbeaten Holbrook by 26 points. The Cats made a great start to lead at half-time by 11 points before Holbrook fought back to hit the front during the third quarter. Osborne, however, settled immediately to kick the next six goals with man of the match Michael Driscoll dominating across the half back line. Ronan and Royce Hunter also starred for Osborne, while for Holbrook Ewan Mackinlay with five goals and Tom Heriot were excellent contributors. Rand-Walbundrie-Walla caused a big upset in the under 14s beating Holbrook who, like their third grade brothers, were unbeaten going into the decider. Both sides had seven scoring shots but it was the Giants with 6-1 to 1-6 who prevailed in another high standard clash. Jack Kotzur was the Giants best. Ben Parker was best for the Brookers. The Giants like their seconds came from the elimination final.